Who Invented the Idea of a Globe Earth? We endorse this statement; therefore let us trace the origin of this Scripture-contra “Science,” and let us analyze its nature and bearings. The origin of the Globular theory may be traced and shown to be Pagan. It was introduced into Egypt by the Greek Pythagoras, about 600 B.C. He was a native of Samos, and a great traveller in his early days. He travelled much in the East. And he imbibed the fallacious idea that the earth and sea together formed a whirling globe, and that the heavenly bodies were other worlds (inhabited). He also accepted the false doctrine of the transmigration of souls, from pagan magicians and Eastern inventors of romance and fiction. 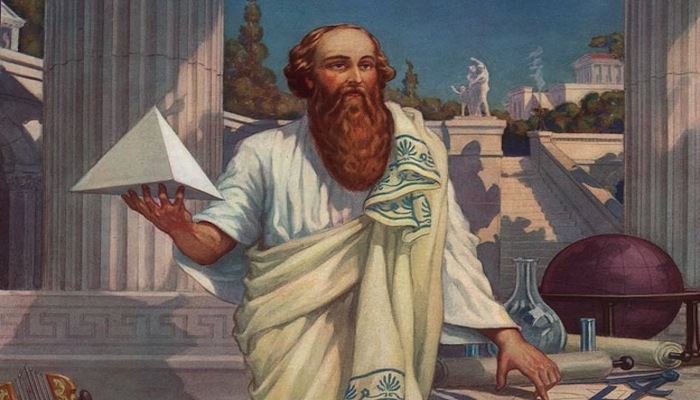 Pythagoras returned to Europe, and introduced these serious errors into his own country; but after a time his party was dispersed, probably through dissent, and he left his native land. He went to Italy, where he met with a warm reception: and there, with a few followers, he collected many disciples and founded a college, and a sect which took the name of Pythagoreans. But ultimately an opposing division besieged and set fire to his College, and many of the Pythagorean students and disciples thus met with an untimely end. And whether Pythagoras escaped himself has never been ascertained. But the mystical pagan doctrines which he had brought from the East were sown in the two European countries, Greece and Italy; and faith in these pagan fables became widely spread; until Ptolemy, who lived contemporaneously with the early Christians, so scouted and denounced these false ideas, that all belief in the earth’s motions, and the transmigration of souls was entirely abandoned for 1,400 years, i.e., until 1,500 A.D., when Copernicus revived the whirling globe theory. But Copernicus’ followers were too hasty in publishing his writings – even before he was himself fully satisfied that the Pythagorean basis on which he had build his calculations rested on a solid foundation. It is stated that his misgivings, cause by dread of censure, were so great that they hastened, if not cause, his death. His most prominent works were published on the very day he died! Kepler and Galileo took up the hypotheses, followed by one of the greatest, if not the greatest mathematician the world has ever produced – namely, Sir Isaac Newton. However, the wisdom of the mortals is no standard measuring-rod of infallibility and Truth. Newton was no logician, and logic formed no part of his composition. Nor did he profess to possess this quality, which is absolutely essential to a discerner and founder of true Science. But Kepler was his ideal fancy, or oracle of wisdom! Thus we may clearly perceive the origin, and manner of establishment of the globular theory; and it is a fact that it is based upon pagan myths, and the nature of its foundations is purely hypothetical, as even Copernicus’ own confessions will testify. And again, that “the hypothesis of terrestrial motion was nothing but a hypothesis.” The supporters of modern astronomy either forget or ignore the self-condemning confessions of the founders of the globe theory, and they also close their eyes to its fabulous nature. Of course it is highly probable that Copernicus knew where Pythagoras had learned this Arabian Nights-like story of the globe theory, and kindred fallacies, which were simply the outcome of the wildest and most ungodly imaginations of ungodly men. And it appears that, but too late, he two some extent realized that his writings were based merely upon falsehoods invented in the far east by mystically diseased heathen minds and practitioners of magic. Continued veracity of the Bible may be tested by its cosmogony. This entry was posted in Bible and science and tagged lady blount, sceince and Bible. Bookmark the permalink.